Fountains are used today to decorate city parks and squares; to honor individuals or events; for recreation and for entertainment. A Splash pad or spray pool allows city residents to enter, get wet and cool off in summer. The musical fountain combines moving jets of water, colored lights and recorded music, controlled by a computer, for dramatic effects. Fountains can themselves also be musical instruments played by obstruction of one or more of their water jets. Drinking fountains provide clean drinking water in public buildings, parks and public spaces. Fountain of Ahmed III next to Topkapı Palace in Istanbul, Turkey. Shortly after the spread of Islam, the Arabs incorporated into their city planning the Persian designs of the famous Islamic gardens. Islamic gardens after the 7th century were traditionally enclosed by walls and were designed to represent paradise. The paradise gardens, were laid out in the form of a cross, with four channels representing the rivers of paradise, dividing the four parts of the world. Water sometimes spouted from a fountain in the center of the cross, representing the spring or fountain, Salsabil, described in the Qur'an as the source of the rivers of Paradise. In the 9th century, the Banū Mūsā brothers, a trio of Persian Inventors, were commissioned by the Caliph of Baghdad to summarize the engineering knowledge of the ancient Greek and Roman world. They wrote a book entitled the Book of Ingenious Devices, describing the works of the 1st century Greek Engineer Hero of Alexandria and other engineers, plus many of their own inventions. They described fountains which formed water into different shapes and a wind-powered water pump, but it is not known if any of their fountains were ever actually built. Fontana di Trevi, the Trevi Fountain by Nicola Salvi, (1730). Two fountains were the centerpieces of the Gardens of Versailles, both taken from the myths about Apollo, the sun god, the emblem of Louis XIV, and both symbolizing his power. The Fontaine Latone (1668–70) designed by André Le Nôtre and sculpted by Gaspard and Balthazar Marsy, represents the story of how the peasants of Lycia tormented Latona and her children, Diana and Apollo, and were punished by being turned into frogs. This was a reminder of how French peasants had abused Louis's mother, Anne of Austria, during the uprising called the Fronde in the 1650s. When the fountain is turned on, sprays of water pour down on the peasants, who are frenzied as they are transformed into creatures. The Splash Fountain in Krasnodar, Russia. The magic fountain in Montjuic, Spain. The book The Theory and Practice of Gardening by Dezallier d'Argenville (1709) showed different types of fountain nozzles which would create different shapes of water, from bouquets to fans. King Fahd's Fountain (1985) in Jeddah, Saudi Arabia. The fountain jets water 260 meters (853 feet) above the Red Sea and is currently the tallest continually-running fountain in the world. Helen Attlee, Italian Gardens – A Cultural History. Frances Lincoln Limited, London, 2006. Paris et ses Fontaines, del la Renaissance a nos jours, edited by Béatrice de Andia, Dominique Massounie, Pauline Prevost-Marcilhacy and Daniel Rabreau, from the Collection Paris et son Patrimoine, Paris, 1995. Les Aqueducs de la ville de Rome, translation and commentary by Pierre Grimal, Société d'édition Les Belles Lettres, Paris, 1944. Marilyn Symmes (editor), Fountains-Splash and Spectacle- Water and Design from the Renaissance to the Present. Thames and Hudson, in cooperation with the Cooper-Hewitt National Design Museum of the Smithsonian Institution. (1998). Yves Porter et Arthur Thévenart, Palais et Jardins de Perse, Flammarion, Paris (2002). (ISBN 978-2-08-010838-8). ^ Philippe Prévot, Histoire des jardins, Editions Sud Ouest, Bordeaux, 2006. ^ "fountain". Encyclopædia Britannica. Retrieved 18 March 2010. ^ Psalms 36:9; Proverbs 13:14; Revelation 22:1; Dante's Paradisio XXV 1–9. ^ Molina, Nathalie, 1999: Le Thoronet Abbey, Monum – Éditions du patrimoine. ^ Allain and Christiany, L'Art des jardins en Europe This type of "water joke" later became popular in Renaissance and baroque gardens. ^ Yves Porter and Arthur Thevenart, Palais et Jardins de Perse, pg. 40. ^ Azraqi, H. Massé, Anthologie persane, pg. 44. English translation of excerpt by D.R. Siefkin. ^ Ahmad Y Hassan. The Crank-Connecting Rod System in a Continuously Rotating Machine Archived 12 March 2013 at the Wayback Machine. ^ Naomi Miller, Fountains as Metaphor, in Fountains- Splash and Spectacle -Water and Design from the Renaissance to the Present, edited by Marilyn Symmes, London, 1998. ^ Pinto, John A. The Trevi Fountain. Yale University Press, New Haven, 1986. 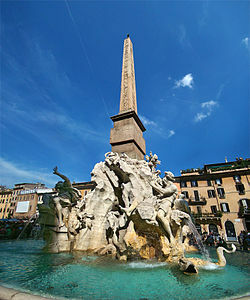 ^ The fountain in Piazza Santa Maria in Trastevere originally had two upper basins, but the water pressure in the early Renaissance was so low that the water was unable to reach the upper basin, so the top basin was removed. ^ Marion Boudon, "La Fontaine des Innocents", in Paris et ses fontaines, de la Renaissance à nos jours, 1995. ^ A. Muesset, Les Francinis, Paris, 1930, cited in Luigi Gallo, La Présence italienne au 17e siècle, in Paris et ses fontaines de la Renaissance à nos jours, Collection Paris et son patrimoine, (1995). ^ Katherine Wentworth Rinne, The Fall and Rise of the Waters of Rome, collected in Marilyn Symmes, Fountains- Splash and Spectacle. (pg. 54). 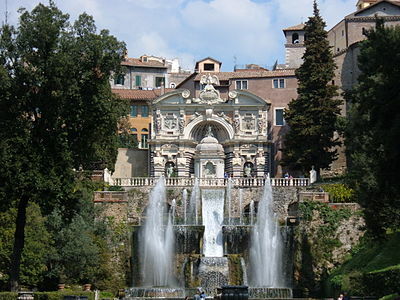 ^ Wentworth Rinne, The Fall and Rise of the Waters of Rome, collected in Marilyn Symmes, Fountains- Splash and Spectacle. (pg. 54). ^ Robert W. Berger, The Chateau of Louis XIV, University Park, PA. 1985, and Gerald van der Kemp, Versailles, New York, 1978. ^ Alexandre Orloff and Dimitri Chvidkovski, Saint-Petersbourg, l'architecture des tsars Editions Place des Victoires, Paris, 2000. ^ Katia Frey, L'enterprise napoléonienne, in Paris et ses fontaines, p. 104. ^ Beatrice Lamoitier, L'Essor des fontaines monumentales, in Paris et ses fontaines. pg. 171. ^ Ric Burns and James Sanders, New York, an Illustrated History, Alfred Knopf, New Yorkm, 1999, pg. 78–79. ^ a b Stephen Astley, The Fountains in Trafalagar Square, in Fountains- Splash and Spectacle – Water and Design from the Renaissance to the Present, edited by Marilyn Symmes, 1998. ^ Figures cited by Pauline Prevost-Marcilhacy, Doctor of the History of Art at the University of Paris IV - Sorbonne, in her essay on fountains, 1900-1940- Entre tradition et modernité, in Paris et ses fontaines, pg. 257. ^ a b "Artropolis". Merchandise Mart Properties, Inc. 2007. Archived from the original on 5 November 2007. Retrieved 13 June 2007. ^ "Crown Fountain". Archi•Tech. Stamats Business Media. July – August 2005. Archived from the original on 2 December 2006. Retrieved 13 June 2007. ^ "Chicago's stunning Crown Fountain uses LED lights and displays". LEDs Magazine. PennWell Corporation. May 2005. Retrieved 18 March 2008. ^ "Frequently Asked Questions". City of Chicago. Archived from the original on 7 March 2009. Retrieved 8 June 2008. ^ Montaigne, M. E.. de, Journal de voyage en Italie, Le Livre de poche, 1974. ^ "About fountain :: Europe's largest floating fountain". www.fountainroshen.com. Retrieved 25 October 2015. Wikimedia Commons has media related to Fountains.